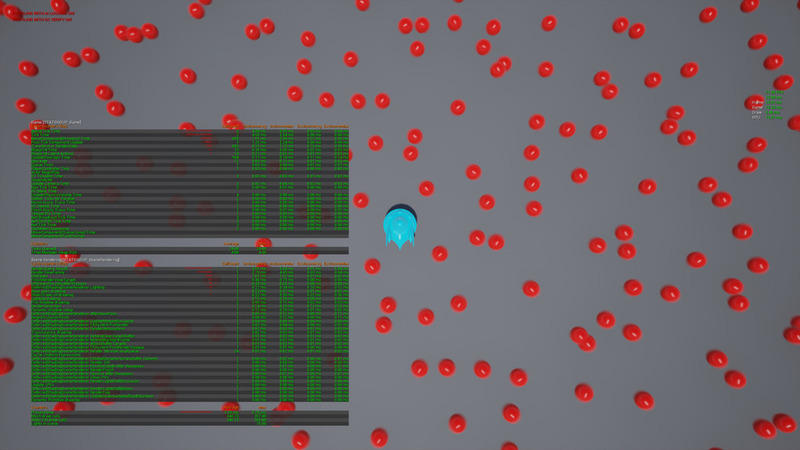 Hey guys, here to talk this new toy I've got here; I had to find a way to workaround the impact on FPS when creating many many bullets for a project. So... This is not just a simple script to hide/show actors. The classes implemented by this plugin builds for you a fully working Object Pool system super easy to use. with minimum performance impact while not falling to the quirks and weirdness of instanced meshes. This is specially useful for VR and Mobile platforms! 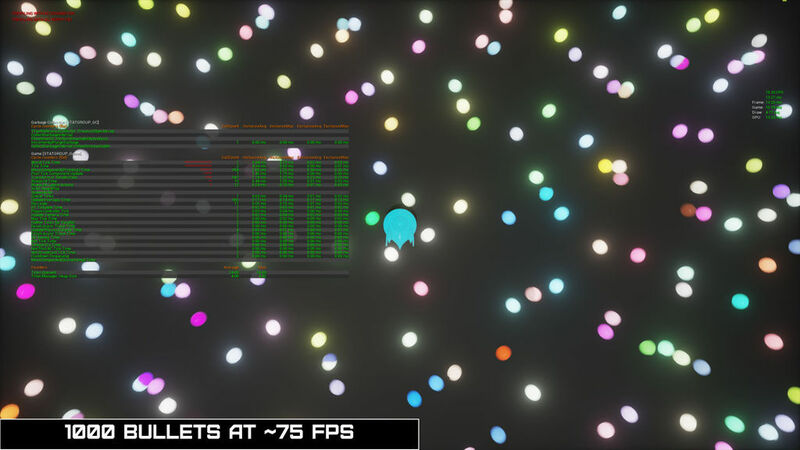 your game will render much much faster when you're in need of rendering and animate thousands of unique projectiles, for example. As you can see in the video, there's 1.000 bullets running around, every second ~220 of them are destroyed and more 200s are created. For just 200 bullets being spawned/destroyed every second, my average fps on UE4 rapidly falls to around 27fps. * NOTE: This is profiling taken on a GTX 780, running in 4K resolution; when in 1080p results are even better. 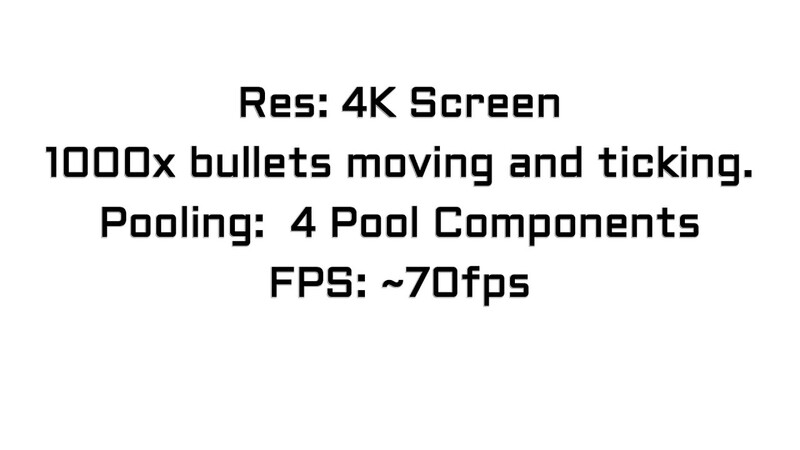 * NOTE: My machine can't go over 75fps with UE4 in 4K resolution, even when Playing In Editor empty scenes. 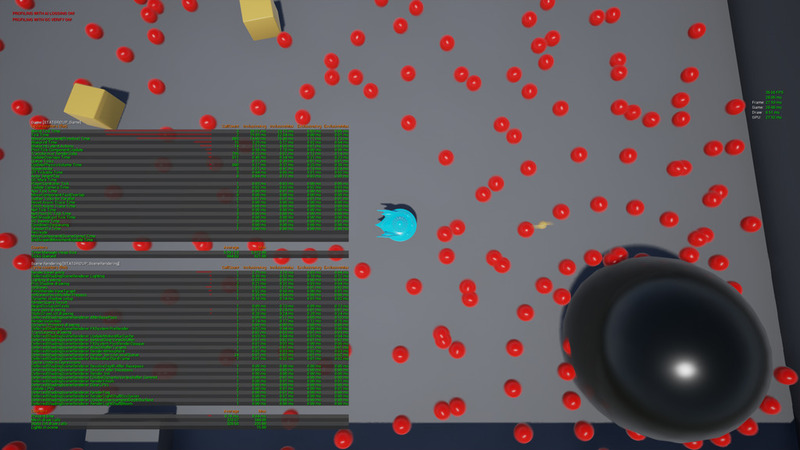 But then on the second map, with pooling system running, my average fps for the same 1.000 bullets being shot is now around 71fps. 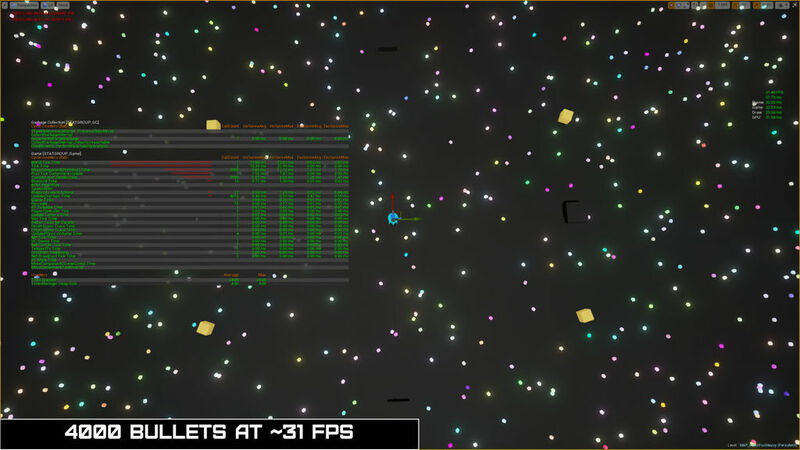 So those 1.000 bullets are now close to insignificant to my FPS, since I can't go over 75fps anyways. Okay, but for a programmer an object pool is relatively simple to make. What is the point here? Well, I've gotta buy assets from Marketplace too you know You help me help you! Also, if you completely hate C++ this is code you don't have to touch, I'll keep it updated for you. Btw, this will always run way much faster than any pooling made by Blueprints, it runs entirely in C++ behind the scenes. I can tell because none of my Blueprint prototypes did run that fast; they've added more overhead instead. Let's have a pool party! 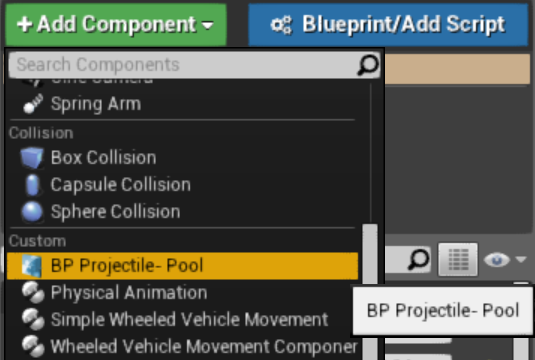 * From your Asset Browser panel, right click and select "Synaptech -> Object Pool" to create a new Pool component. Set the Template Class which is a child of APooledActor (example: from case above, could be any of the Projectile, MG_Bullet or M8_Bullet classes). * From there, your pooled Actor is a regular Actor just like any other and can code it to do anything you need. Now, when you need the pooled Actor removed from the Level, do not destroy it! Instead, send it back to the Pool where it stays sleeping while your Pool component is still present in the level (note: if you destroy the Actor owner of the Pool component, all its pooled Actors will be destroyed with it as well). 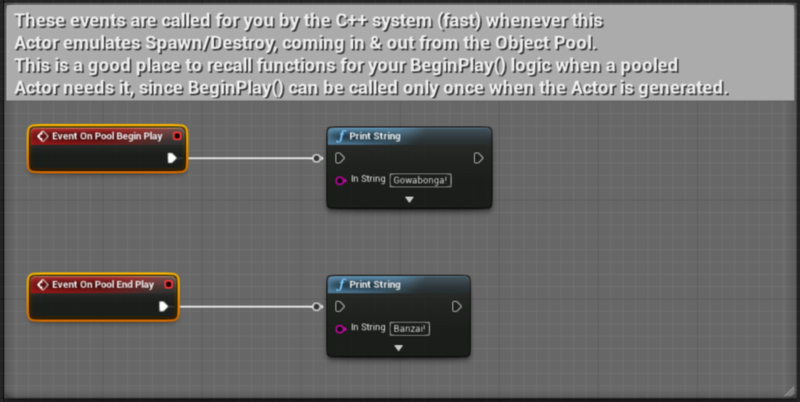 All your Actors child of APooledActor have this default Node which you can use to remove them from the level without causing hiccups in the game. Depending on use case and demand, I will soon update to add support for Pooled Characters and Pawns! Just like with my other plugins, my intentions here are to gather funding to buy myself assets from Marketplace too, so I plan to make it very affordable for everyone, $10 bucks or something like that; cheers! C++ coders can use templated functions to cast directly, Blueprints have to cast manually. * GetObjectArray(): Directly access Actors storage, be careful what you do with this. * GetObjectsFromPool(): Returns two Arrays from the Pool, Spawned and Inactive member Actors. * GetSpawnedObjects(): Returns an Array of currently spawned Actors from the Pool. * GetInactiveObjects(): Returns an Array of currently inactive Actors in the Pool. * GetSpawnedObject(): Returns an Actor currently spawned from the Pool. * GetInactiveObject(): Returns an Actor currently inactive in the Pool. * GetObjectsFromPool<T>(): Returns Array of Actors from Pool, type-casting to T.
* GetSpawnedObjects<T>(): Returns Array of spawned Actors from Pool, type-casting to T.
* GetInactiveObjects<T>(): Returns Array of inactive Actors in the Pool, type-casting to T.
* GetPawnArray(): Directly access Pawns storage, be careful what you do with this. 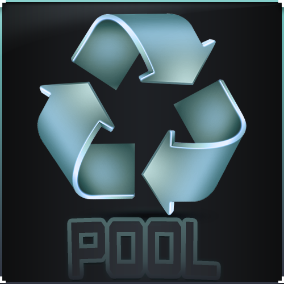 * GetPawnsFromPool(): Returns two Arrays from the Pool, Spawned and Inactive member Pawns. * GetSpawnedPawns(): Returns an Array of currently spawned Pawns from the Pool. * GetInactivePawns(): Returns an Array of currently inactive Pawns in the Pool. * GetSpawnedPawn(): Returns a Pawn currently spawned from the Pool. * GetInactivePawn(): Returns a Pawn currently inactive in the Pool. * GetPawnsFromPool<T>(): Returns Array of Pawns from Pool, type-casting to T.
* GetSpawnedPawns<T>(): Returns Array of spawned Pawns from Pool, type-casting to T.
* GetInactivePawns<T>(): Returns Array of inactive Pawns in the Pool, type-casting to T.
* GetCharacterArray(): Directly access Characters storage, be careful what you do with this. * GetCharactersFromPool(): Returns two Arrays from the Pool, Spawned and Inactive Characters. * GetSpawnedCharacters(): Returns an Array of currently spawned Characters from the Pool. * GetInactiveCharacters(): Returns an Array of currently inactive Characters in the Pool. * GetSpawnedCharacter(): Returns a Character currently spawned from the Pool. * GetInactiveCharacter(): Returns a Character currently inactive in the Pool. * GetCharactersFromPool<T>(): Returns Array of Characters from Pool, type-casting to T.
* GetSpawnedCharacters<T>(): Returns Array of spawned Characters from Pool, type-casting to T.
* GetInactiveCharacters<T>(): Returns Array of inactive Characters in the Pool, type-casting to T.
* GetOwningPool(): Returns a direct reference to the Pool Component owner of this Actor. Last edited by BrUnO XaVIeR; 10-01-2017, 01:20 PM. This is actually very useful for a lot of things, definitely worth $10 I'd say. Hope it gets put on the marketplace ASAP! Awww, I really like "quality of life" plugins like this. Could you please update us when it's ready to be thrown money at? Essential plugin but having crash-issue with 4.14. 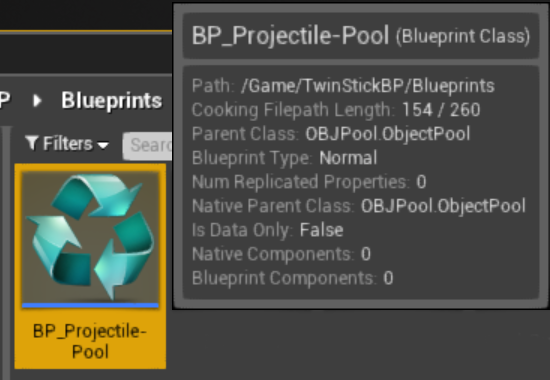 Seems like if the pool have some destroed actors, then the editor crashes when "empty object pool"-node is used, the related blueprint (that have the pool) is destroyed or play in viewport session is ended. Thanks, I will check this right now. 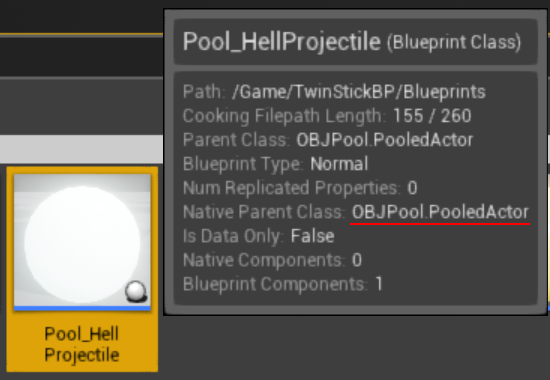 Just keep in mind that pooled objects are not supposed to be destroyed (destroy the pool owner instead), but it shouldn't crash because of that, I will see where the mistake is. I have found the crash reason, I've fixed it and will submit to Epic as soon as I can. The thing is, I forgot about one thing: to check if any of Pooled Actors are marked by the engine as Pending Kill before I tell the Pool Component to be empty. The result is that once you destroy a pooled actor, it is not immediately gone... It is marked as pending kill until GC is able to collect, but there's a pointer in the Pool holding reference to the destroyed Actor and once you use the 'Empty Pool' in this case you are actually calling Destroy() function 3x on an Actor that is not valid anymore. I just had to check if the pooled Actors are valid at low level, just one line of code inside the Empty Pool function. Great to hear , thanks for the instant response. Cant wait to try the upcoming update. Was using the pool for bullets. Tried to prevent those getting destroyed, but seems those ended up to z world removal. I've sent the files to Epic already; I have to sit and wait now. Fix is already on Marketplace. Last edited by BrUnO XaVIeR; 02-10-2017, 07:21 PM. Does this plugin support c++ Actor ? And how to pool the particles? Last edited by liuwei; 02-12-2017, 11:48 PM. I'll definitely be buying this!! Very excited for the Pooled Characters and pawns!